Richard Spencer ally Greg Conte announced his resignation from several alt-right groups headed by the one-time golden boy of the alt-right movement on Twitter Monday. The resignations cover positions Conte held with the National Policy Institute, a small think tank Spencer runs backed by right-wing extremist William Regnery, the Altright Corporation and Washington Summit Publishers, a small book publishing operation that produces alt-right and conservative titles. Spencer, who in the last 24 hours has tweeted about a variety of things, including the idea of a black man playing James Bond and the latest pedophilia scandal in the Catholic Church, but has not commented on Conte’s announcement. 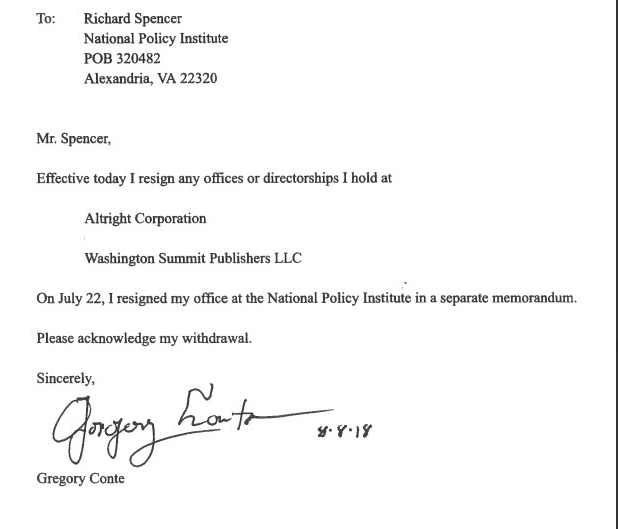 There’s no mention of Conte’s resignations on the alt-right.com website, the National Policy Institute website, which Spencer also runs, or the Washington Summit Publishers website. Conte’s split from Spencer is the latest sign that Spencer’s status among the alt-right is falling. The year didn’t start off well for Spencer, who had to publicly part with associate Eli Mosley (whose real name is Elliott Kline) after a New York Times article threw into question Kline’s claim of military service in Iraq. Spencer also dropped his ill-received college speaking tour after a disastrous engagement at Michigan State in March, which saw multiple fights and arrests (including of Conte) outside the agricultural arena where a small audience went to hear him. Another Spencer ally, Evan McLaren, resigned as head of the National Policy Institute in April. McLaren took to Twitter to announce the move, describing it as simply a shuffling of personnel in order to put the best people in the right spots at NPI. Spencer did not offer any comment on McLaren’s departure, and the National Policy Institute website has not listed a replacement for him. Spencer has generally been quiet since ending the college tour. Some of his much-ballyhooed initiatives have gone publicly dark, including Operation Homeland, which Spencer announced in December with the stated goal of being professional organizers and activists for the white nationalist and neo-Nazi movement. The group held one immediate rally but save for a few flyers being left on college campuses hasn’t been heard from since. Conte’s departure from the organizations also comes as the alt-right movement appears to be hitting a low point. On the anniversary of the deadly 2017 “Unite the Right” rally in Charlottesville, Virginia, organizer Jason Kessler tried to hold a second gathering last week in Washington, D.C., under the label of a “white civil rights” rally. Protesters outnumbered Kessler’s followers by an estimate of 15,000 to roughly two dozen followers of Kessler at Lafayette Square Park in the nation’s capital. And neither Kessler, Spencer nor the alt-right generally even tried to make a stand in Charlottesville one year after overrunning the city’s popular downtown mall during a deadly weekend. Spencer didn’t appear at Kessler’s rally, having disavowed him a year ago, and didn’t make a return trip to Charlottesville, either.